CINCINNATI (AP) — A Republican senator who’s a former U.S. trade official voiced concern Friday about the impact President Donald Trump’s trade battles will have on the Ohio economy. Sen. 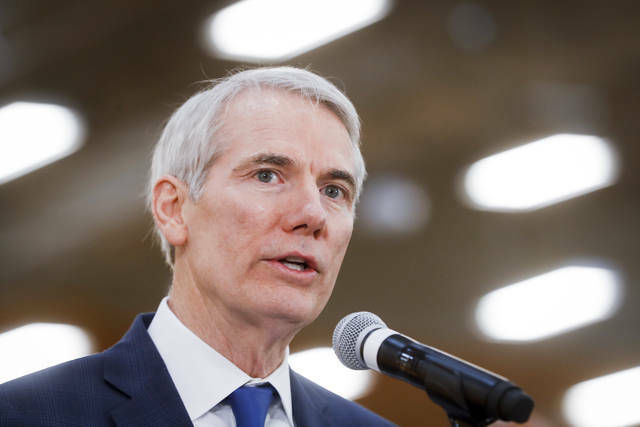 Rob Portman, a U.S. trade representative during George W. Bush’s presidency, said he supports being tough with China but would like to see more caution and negotiating with the European Union, Canada and Mexico. The United States and China launched a trade war with each other on Friday. The Trump administration’s tariffs on imported steel and aluminum from U.S. allies also have triggered trade retaliation. But Portman said the United States does need to ensure that countries “play fair,” and that China should reciprocate on trade and investment and shouldn’t take intellectual property without following rules. “I think the administration needs to shake it up a little with China,” Portman said. In dealing with the steel tariffs and Canada, Mexico and European Union, he said there should be more efforts to work out trade differences. Portman on Friday visited PreventionFirst!, a Cincinnati-based anti-drug coalition he’s long been involved with. Executives have a powerful incentive to cheat their workers: to pad their own exorbitant paychecks. The health of our American economy ultimately rests on a single, simple word: trust. Employers on the one side and employees on the other have to be able to trust each other to behave honorably. A fair day’s wage, as the classic formulation puts it, for a fair day’s work. This mutual understanding gets broken on a regular basis, particularly when employees put in that fair day’s work and don’t get paid a full fair day’s pay. Labor market analysts have come to call these betrayals of trust “wage theft,” and this thievery is thriving. Offenders include the predictable fly-by-night operators we would expect. But the culprits also include, as an alarming new report details, billion-dollar corporations that can clearly afford to honor their side of our core employer-employee bargain. These companies are committing their thievery on many fronts. They’re not paying employees for work performed “off the clock.” They’re stiffing workers on overtime and violating minimum wage laws. They’re requiring employees to buy particular work clothes and not compensating them for their outlays. How widespread has this corporate wage theft become? Grand Theft Paycheck, a landmark new study from Good Jobs First and the Jobs with Justice Education Fund, examines over 1,200 lawsuits against wage theft that groups of workers have won since 2000. Employers in these cases paid out a combined $8.8 billion in penalties. And that total just hints at how widespread wage theft has become. Only eight states currently enforce wage theft regulations and provide data on that enforcement. Many wage theft settlements also remain confidential. The obvious question these realities raise: What’s driving our massive wage thievery? The giant U.S. corporations involved in this theft — retailers like Walmart, telecoms like AT&T, banks like JPMorgan Chase, insurers like State Farm — can all easily afford, as Grand Theft Paycheck puts it, “to pay their workers properly.” So why don’t they? The reasons vary. With a declining union presence in America’s workplaces, workers have become more vulnerable. Politically motivated attacks on “regulation,” meanwhile, have left many government watchdog agencies woefully underfunded. But the biggest reason major corporations are cheating their workers remains more basic: The outrageously generous rewards that have become so commonplace in corporate America give the executives who run our top corporations an ongoing — and almost irresistible — incentive to behave outrageously. To hit the corporate jackpot — to pocket double-digit millions and more — these execs will do most anything. They’ll cook their corporate books. They’ll shortchange R&D. They’ll outsource and downsize. They’ll cut worker pensions. They’ll take reckless risks. And, yes, they’ll commit wage theft, often brazenly. All this outrageous behavior pays outrageously well. Among the dozen American companies most penalized for wage theft, four compensated their CEOs last year at over $20 million, and only two shelled out under $8 million. Against these colossal millions, the threat of penalty fines for wage theft hasn’t had much of a deterrent effect. Would larger fines make a difference? Would more systematic regulatory oversight reduce levels of wage theft? Would a stronger union presence discourage corporate thievery? Undoubtedly yes. But those who run our corporations aren’t going to abandon their thieving ways so long as that thievery can pay so well for them personally. Wage theft didn’t start soaring in the United States until the late 1970s, the same years that eye-popping CEO pay packages became a standard fixture on the corporate scene. Corporate execs have had, for nearly five decades now, a powerful incentive to cheat their workers: their own exorbitant pay. Let’s end it. Sam Pizzigati co-edits Inequality.org for the Institute for Policy Studies, where an earlier version of this piece appeared. His latest book, The Case for a Maximum Wage, has just been published. Distributed by OtherWords.org. For decades, American presidents from John F. Kennedy to Ronald Reagan to Barack Obama have spoken about America as a shining “city on a hill” — a beacon of hope and opportunity for the world as a nation built upon fundamental freedoms, respect for the rule of law and human rights. The Trump administration’s actions recently, however, suggest that beacon may be fading. In the span of days, the U.S. government picked fights with close allies and opposed language supporting a “rules based international order” at the G7, declared it would not accept individuals fleeing domestic or sexual violence seeking asylum, and praised North Korea’s brutal dictator before offering to halt military exercises and withdraw from the Korean Peninsula in exchange for a promise to denuclearize. It seems “America First” places our values last. While Trump’s message to the world is that the United States has better relations with North Korea than with Canada, his administration has announced policies that the threat of domestic violence and gang violence is not grounds for asylum in the United States and defended its cruel and inhumane practice of separating children from their parents at the border. None of the actions the United States has taken in recent weeks reflect the shining “city upon a hill” that past presidents have described or the values that have underpinned America’s worldview. The United States’ relationship to its values is about more than soaring rhetoric — they are central to America’s ability to lead. The United States has long been a force for good in the world — driven by its core values in fundamental freedoms, respect for the rule of law, and human rights. America put war criminals on trial following World War II, rebuilt Europe and sent aid to Asia. Both Democratic and Republican administrations have recognized America’s ability to positively engage the world — just two recent examples include the President’s Emergency Plan for AIDS Relief program, championed by President George W. Bush, and President Obama’s coordinated response to the Ebola outbreak in West Africa, which saw the United States galvanize global efforts to stop the spread of the disease. Now, America’s ability to be a force for good in the world may be at risk. Not only will U.S. diplomats have less credibility to urge international counterparts to uphold human rights but they will also be less able to marshal support for American national security priorities. If there is to be a new Iran Deal, U.S. diplomats will face a much tougher international environment — relations with European allies are already strained and they are less likely to follow a United States that is perceived to no longer strongly share its values. Additionally, if America is not championing its core values, it is much more difficult to persuade others to follow our lead rather than others’. Nations may consider the United States to be just as transactional as Russia and China. Similarly, as the world watches thousands of families separated at America’s southern border and children being held in tent camps, dissidents, freedom fighters and civil rights leaders around the world may no longer wish to follow America’s lead. It is true that the United States has fallen short of its ideals in the past. American history is full of moments when the United States was less than its best self. Nevertheless, it is difficult to recall a time when the United States has acted so openly dismissive of its core values, ready to fight with its democratic allies and embrace brutal dictators. If the United States is to maintain its leadership position in the world — and continue to be a shining “city on a hill” — it must remember that America’s values are the source of its strength. Yuvaraj Sivalingam is a security fellow at Truman National Security Project. He wrote this for InsideSources.com. Crews installed a commissioned piece of public art on the City Hall Courtyard, 21 S. State St. Named The American Issue, the sculpture symbolically represents Westerville’s historic role in Prohibition as the home of the Anti-Saloon League 100 years ago. The sculpture was purchased with private funds and donated to the City. Learn more about the sculpture and those who helped bring it to our City, including nationally renowned artist and sculptor Matthew Gray Palmer, at www.westerville.org/americanissue. The City of Westerville welcomed the first Columbus-region BRU Burger restaurant to 691 N. Cleveland Ave., in the Westar Place-area, on Monday. Located conveniently across the street from a COTA CMAX BRT stop, BRU Burger joins other unique amenities in the area like the newly opened Local Cantina. The restaurant’s opening marks yet another development milestone in the City. The City is completing maintenance for several Uptown parking lots. Westerville Electric Division customers who own a Nest thermostat can receive a $75 rebate when they register for the Rush Hour Rewards Program. Work to improve traffic flow and safety near Cleveland Avenue and Schrock Road continues. Crews are installing guardrails and signage along the new ramp from southbound Cleveland Avenue to Interstate 270 West. Grand Opening of the new Hanby Park & Splash Pad at Park & Summit. Warranty repairs continue on sidewalks in the area of the South State Street Improvement Project (Phase II). Single-lane closures are needed during this time. All work is weather permitting. The City of Westerville is requiring the contractor of the South State Street Improvement Project (Phase II) to make repairs to sidewalks in the project area. This work is being completed at no cost to the City. Repairs are expected to begin on Monday, April 30 and take approximately four weeks to complete. Single-lane closures will be needed during this time. All work is weather permitting. Learn more about improvement projects around the City on the interactive GoWesterville map. The Westerville Fire Division is encouraging residents to inspect their smoke detectors after a recall was issued for more than 450,000 Kidde-brand units sold in the United States. According to Kidde, the ability for dual-sensor models PI2010 and PI9010 to detect smoke may have been compromised. Find more information on Kidde’s website. Are you in need of new smoke detectors? The Westerville Division of Fire is partnering with the American Red Cross to offer free smoke detectors and installation for Westerville and Blendon Township families. Simply put: you call, we’ll install. Learn more about this program. The Westerville Electric Division is reminding residents to recycle batteries responsibly in marked receptacles at their facility, 139 E. Broadway Ave. This service is available 24/7. Including batteries with regular refuse collection can be dangerous. Rumpke reports that more than a dozen truck fires in 2017 resulted from batteries. When enough batteries are collected, the Electric Division will take them to the Westerville Public Service Department for safe disposal. Accepted batteries include lithium (rechargeable), lead acid wet cell (vehicles) and typical household (AA, AAA, C, D, etc.). City officials have recently received an earful from residents protesting a proposed Orchid Asian Spa at the Westerville Square Shopping along Otterbein Avenue. “The City of Westerville is aware of the proposed massage business advertising to open in Westerville Square. We have also been aware of other businesses operating in the City which offer massage services. “The business advertising to open in Westerville Square is not open. The City has not issued an occupancy permit for this location, which is required by the Ohio Building Code before the applicant (business owner) may open their doors. Any business with an occupancy permit in the City is obligated to operate their business within the scope of their approvals and all applicable laws and ordinances. If a lapse in compliance with such laws or ordinances occurs, the City may rectify that with either code enforcement or law enforcement measures. Inspections from the City’s code enforcement staff would be required to ensure the applicant is operating as permitted. “The Westerville Square location has applied to operate as a spa. At this time, only a permit for interior construction (building permit) and a plumbing permit has been issued by the City. “What can the City do? “City staff has monitored and addressed as many questions as we are able to answer at this time. Public concerns have been heard and the City will continue to use the tools available to address any business operating outside of its permitted use. “The Westerville Division of Police and the Code Enforcement Division will monitor activity at establishments for compliance with all applicable laws and regulations. “Legitimate massage businesses have a legal right to operate as a matter of law in appropriately zoned locations, as long as they do not violate state or local laws. “Until there is evidence of a violation, the City has limitations on how and to what extent it can intrude on a business without probable cause. “Westerville recently took measures to change and tighten zoning requirements for massage businesses. New massage businesses can only provide massage services when the person performing the massage is licensed by the state of Ohio. Update: The business sign has since been withdrawn from the shopfront and the space is being renovated. Don McCauley, executive director of AMVETS Department of Ohio gave a donation totaling $3,000 from AMVETS members from all over Ohio to support the families of fallen Westerville Police officers Eric Joering and Anthony Morelli, who were killed in the line of duty while responding to a hang-up 9-1-1 call on Saturday, Feb. 10. They were the first police officers killed in the line of duty in Westerville’s 160-year history. The City of Westerville and the Westerville Division of Police thanked the Central Ohio community for their continued support in honoring the fallen officers. Stay up-to-date about ways to help WPD and the families of Officers Anthony Morelli and Eric Joering at www.westerville.org/westervillestrong. Westerville City Council voted unanimously to give Ofc. Eric Joering’s family custody of the fallen officer’s K-9 partner Sam on February 20, 2018. Westerville Police Chief Joe Morbitzer turned over Sam’s badge to Joering’s daughters, who were also offered four-year scholarships from Otterbein University. Also at the meeting, Westerville’s newest officer, Khyrell Baggoo, was sworn in. Earlier this month, Columbus Police arrested a 62-year-old woman accused of stealing hundreds of dollars from a donation box for officers Joering and Morelli from the Average Joe’s Pub and Grill on Henderson Road in Columbus. It is believed most of money was spent on playing a lottery machine near the box. The annual Westerville Bunny Hop 5K is a family-friendly race for all ages and abilities taking place at 8 a.m. on Saturday, March 31. After the run is the Spring Eggstravaganza with more than 8,000 eggs. Proceeds benefit the Westerville Parks Foundation, which raises funds to help the Westerville Parks and Recreation Department make improvements to parks and facilities and give residents in need access to participate in health, wellness and recreational programming. Sign up and learn more at www.westervillebunnyhop.com. The Westerville Division of Police recovered a firearm and arrested a 17-year-old student from Westerville South High School on Feb. 23. “An anonymous caller had earlier warned the school the student was carrying a firearm,” said a press release issued by the police. The student was charged with a misdemeanor count of Inducing Panic; a felony count of Tampering with Evidence; a felony charge of Carrying a Concealed Weapon; a felony charge of Illegal Conveyance/Possession of a Deadly Weapon in a School Safety Zone; and a felony charge of Receiving Stolen Property. He was transported to Franklin County Juvenile Detention Center. Enjoy hands-on experiences like riding in a bucket truck, driving a snow plow and taking facility tours with the 2018 Westerville Citizen’s Academy, beginning April 19. This free, eight-week class allows Westerville residents a unique glimpse inside their City. To register, visit www.westerville.org/wca. The traffic signals at the intersection of Spring and Maxtown roads recently were repaired after a car accident. If you ever find yourself in a similar instance, please treat the intersection as a four-way stop (unless @WestervillePD officers are present directing traffic) while they work to repair the signals. The city held its annual State of the Community at #Westerville City Hall on Feb. 27. The City and its community partners reflected on 2017 and previewed what’s yet to come in 2018. The Westerville Division of Police (WPD) hosted a community forum on human trafficking on March 26 at City Hall, 21 S. State St. Experts at CATCH Court, The Salvation Army, Central Ohio Rescue and Restore Coalition and WPD talked about what’s being done to investigate and arrest traffickers, help victims and how your advocacy can change lives. Officers from the Westerville Division of Police met with older adults in the community at Westerville South High School, 303 S. Otterbein Ave. on Saturday, March 24. The free educational event provided participants with resources about scams, identity theft protection, personal safety, health services and estate planning. The Village of Ostrander is excited to announce that Consolidated Cooperative will be bringing both natural gas and residential fiber optic services to Ostrander and the surrounding areas. Construction is planned to begin as early as the summer of 2018. Natural gas provides an economical, alternative heating solution for homes, and the resident fiber optic service will bring internet speeds up to 1,000 (gigabit) mbps into the home. More details will be forthcoming as Consolidated works through the engineering and permit processes. Local Cantina being built at the corner of Cleveland Ave. and Executive Campus Drive, Bru Brothers. Since the beginning of the 2011 season, the UConn women’s basketball team is 8-7 against Notre Dame and 249-5 against everyone else. Work to install new medians along Maxtown Road, east and west of State Street, and Cleveland Avenue, at Westerview Drive is complete. New pavement striping will follow as weather permits. These medians prohibit left turns in areas with high crash ratings. Certain left turns remain permitted as marked. People often comment picturesque nature of Otterbein University’s campus. What many don’t know is that behind the scenes, some very intentional work has been done to make the campus not only beautiful, but also environmentally responsible. Thanks to that work, Otterbein has been named a Tree Campus USA by the Arbor Day Foundation. Otterbein was honored alongside the City of Westerville, which received both the Tree City USA and Tree Line USA award, at a ceremony on March 6, the day of the Governor’s State of the State address on campus. The ceremony made Westerville the first city in Ohio to have the Triple Crown of tree programs: Tree Campus USA, Tree City USA, and Tree Line USA. The Tree Campus USA designation is awarded to two- and four-year accredited colleges and universities that meet or exceed five standards established by the Arbor Day Foundation relating to tree care and stewardship, education and community engagement. The program recognizes the importance of trees, which help improve air quality and reduce storm runoff, provide food and shelter for local wildlife, shade homes and buildings, and improve privacy and aesthetic improvements when incorporated into commercial and residential landscaping. “The Tree Campus USA designation is a reflection of the strategic work of Otterbein’s grounds team. We take a holistic approach to maintaining and improving our campus, with sustainability as a high priority,” said Troy Bonte, executive director of facilities management and planning. While much of the work goes on behind the scenes, Otterbein has hosted public events, as well. The university celebrated Arbor Day in 2016 and 2017, and at Homecoming in September 2017 officials planted a red oak tree and handed out 100 saplings. Otterbein is located in the heart of Westerville, one of the original Tree City USA communities, and Ohio, the nation’s leader in Tree City USA communities. Having this designation for 42 years is incredibly meaningful because of the consistency and dedication the City of Westerville has demonstrated to this initiative over time. Since the program began in 1976, many communities have lost their Tree City USA designations, either as a result of funding cuts or new goals and priorities. In fact, of the 42 communities that were named Tree Cities in the first year, only 16 have successfully retained their status for at least 40 years. Westerville is one of those communities. The ODNR Division of Forestry assists communities in enhancing the quality of life within cities and villages through comprehensive urban forestry programs. Ohio’s original Tree City USA communities were: Springfield, Westerville and Wooster. In 1997, Ohio became the first state to have more than 200 Tree City USA communities. In 2017, Ohio was recognized as the nation’s leader in Tree City USA communities for the 36th consecutive year with 243 participating cities, villages and townships, according to the Ohio Department of Natural Resources (ODNR). The City of Westerville owns and operates its own electric utility, and the Westerville Utility Division received its 20th Tree Line USA designation for its tree management efforts. The Tree Line USA program recognizes best practices in public and private utility arboriculture, demonstrating how trees and utilities can co-exist for the benefit of communities and citizens. Congratulations to the Westerville Electric Division (WED). The journeyman team earned a perfect score while competing in the American Public Power Association’s National Public Power Lineworkers Rodeo in Raleigh and Wake Forest, N.C. over the weekend. The Stoner House is on the National Register of Historic Places for its role in the Underground Railroad.